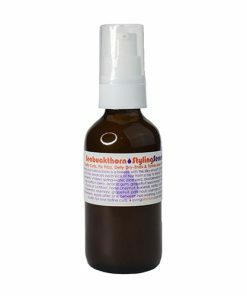 Living Libations’ Seabuckthorn Styling Serum topples typical hair care products to the ground! This silky-smooth serum ensorcels each lock of hair, achieving perfect balance from scalp to strand. Go beyond the chemical-filled gels and sprays that make the hair bland, and infuse your luscious locks with nourishing botanicals. Clarify curls, fix frizz and defy dry ends! Styling your lustrous locks is a breeze with our synthetic-free serum made of pure plant botanicals. 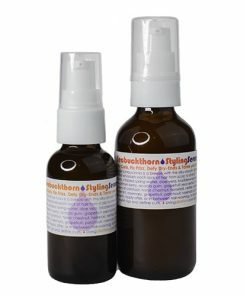 Our Seabuckthorn Styling Serum simply swoons for hair that’s been doomed by dryness, brittle ends, and frazzled curls. This ultra-thin, highly conditioning gel is a lightweight, non-sticky styling serum made to maintain your mane’s optimum moisture. For body, shine, and a styling gold mine, grace each strand with the helping hand of our Seabuckthorn Styling Serum. 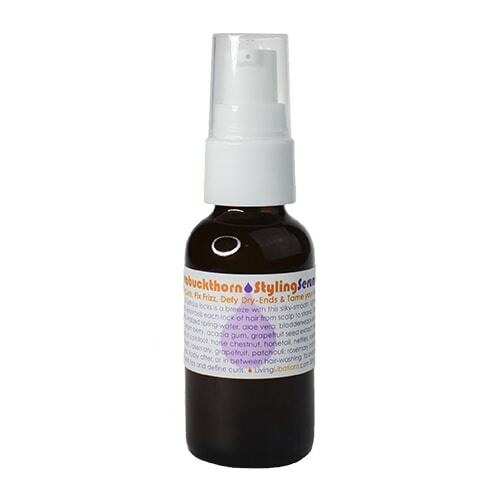 Living Libations’ Seabuckthorn Styling Serum topples typical hair care products to the ground! This silky-smooth serum ensorcels each lock of hair, achieving perfect balance from scalp to strand. Go beyond the chemical-filled gels and sprays that make the hair bland, and infuse your luscious locks with nourishing botanicals. The foundation for this creation is pure, vitalized spring-water that undergoes a 6-step purification process through volcanic minerals. Once we have achieved a blank slate from which to create, we invite scalp-loving seaweed into our blend. This wild-harvested seaweed soothes the scalp infuses hair with vitamins and minerals. Enter aloe vera to moisturize and define, followed by the ancient resin of acacia gum for increased shine. Tangled strands? Silky seabuckthorn is here to lend a hand. But wait – we’ve only just begun! What would a marvelous mane be without the help of herbal infusions of coltsfoot, horse chestnut, and horsetail? With the help of these herbs (plus nourishing nettle), your own flowing mane is sure to prevail! Our top five “hair-brained” essential oils round out the benefits of this serum, which nourishes hair from beginning to end. There’s peppermint oil to regulate scalp pH, rosemary to stimulate circulation, patchouli to prevent dryness, grapefruit to enhance healthy shine. This all-natural, pure botanical Hair Styling Serum will breathe new life into tired tresses while undoing synthetic product messes. Pure Vitalized Spring-Water (Aqua) – Vitalized water is the purest, most beneficial liquid on earth for the human body. Vitalized water undergoes a multi-step purification process where it is filtered through volcanic minerals. The perfectly pH-balanced water that remains nourishes thirsty hair the way Mother Nature intended. Wild Harvested Seaweed Extract (Fucus Vesiculosis) – Also known as bladderwrack, our wild-harvested seaweed extract is a traditional treatment for hair thinning. It is packed with free-radical scavenging antioxidants, is highly antibacterial, and contains beneficial B vitamins and trace minerals to support hair and scalp health. Aloe Vera Gel (Aloe Barbadensis) – Our fresh filleted and nourishing aloe vera contains high levels of proteolytic enzymes, which work to rejuvenate the scalp and chemically processed hair. This moisturizing offering from the aloe plant is a natural emollient used to increase shine and smooth split ends. Aloe vera is said to speed the growth of hair, eradicate itchy scalp, eliminate dandruff, and condition course hair. 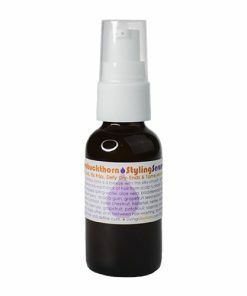 Seabuckthorn Berry (Hippophae Rhamnoides) – The Latin name of the berry producing Seabuckthorn bush means “tree that makes the horses shine” referring to the berries benefits of making horses healthy and have shiny hair. Our seabuckthorn berry oil is a super-critical extract that is packed with vitamins and essential fatty acids with an affinity for strong, shiny, lustrous locks. In 2009, researchers from China identified seabuckthorn as an effective remedy against a scalp-loving parasite found to cause everything from balding to gray hair. This parasite, known as the demodex parasite, survives on the scalp by feeding off dead skin cells. In the Chinese study, seabuckthorn oil effectively killed the parasite, which in turn reduced hair loss and graying hair. Acacia Gum (Acacia Farnesia) – This is a naturally occurring resin, a hardened sap that is harvested from the acacia tree. In ancient times, the Greeks and Romans used this special resin to style and set their hair, increase shine, heal skin wounds and balance the skin. Today, acacia gum is often used as a binding or thickening agent in natural hair products and foods. 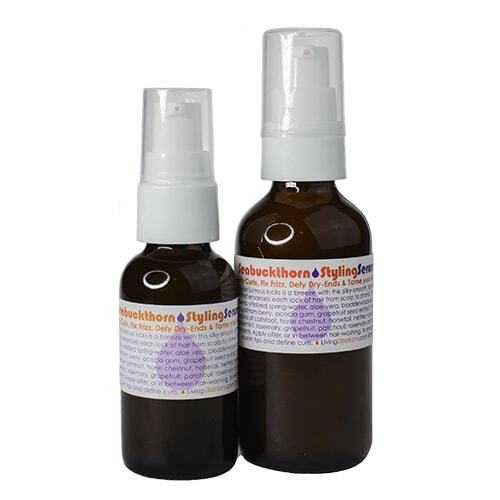 Grapefruit Seed Extract (Citrus Paradisi) – Grapefruit seed extract is cleansing and deodorizing for the hair. It is used to rid the scalp of buildup, including salt, dirt, and chlorine from swimming. In addition to promoting shine and body, grapefruit seed oil is said to fight dandruff, detangle hair, remove toxic product buildup, support healthy hair follicles, and stimulate hair growth. Coltsfoot (Tussilago Farfara) – Coltsfoot contains high levels of minerals and amino acids to nourish the hair and scalp, including Silica, Sulfur and Cysteine. These elements are said to promote healthy hair growth, strengthen the hair, prevent breakage, boost elasticity, and prevent buildup and flaking on the scalp. Coltsfoot is also antimicrobial, anti-inflammatory, and helps to regulate sebum production on the scalp. Horse Chestnut (Aesculus Hippocastanum) – Horse chestnut is a fierce anti-inflammatory used to soothe itching, flaky skin on the scalp. It is also used to enhance circulation and blood flow to the scalp, which in turn may stimulate hair growth. Horsetail (Equisetum Arvense) – Horsetail is an antioxidant and stimulant used to prevent hair loss. It supports healthy hair follicles, and its’ stimulating effect is said to increase circulation to the hair shaft. The improved flow of blood to the hair follicles, coupled with a decrease in inflammation, is said to prevent further hair thinning and even encourage the growth of new hair. Nettle (Urtica Dioica) – Nettle is an ancient remedy for hair loss that has just recently been rediscovered by naturopaths and the medical community. Nettle inhibits the function of DHT (Dihydrotestosterone), a metabolite that shrinks the hair follicles and blocks the uptake of important nutrients to the hair. By inhibiting production of DHT in the body, nettle may help the hair follicle to remain healthy and intact, thus preventing loss of hair. Rosehips (Rosa Canina) – Rosehips are hydrating and moisturizing for dry scalp, and may be used to address dandruff. Because of the omegas, vitamins, and antioxidants contained in rosehips, the oil is often used to nourish dry, brittle hair and prevent flaking. Rosehips oil contains retinol, omegas 6 and 9, lycopene, beta-carotene, and naturally occurring Vitamin C.
Peppermint (Mentha Piperita) – Potent peppermint is used to boost oxygenation and blood circulation to the scalp, which in turn may support healthy hair growth. Peppermint is often used to restore the scalp skin to its proper pH levels and regulate sebum production on the scalp. Rosemary (Rosmarinus Officinalis) – There is perhaps no other essential oil so perfectly suited to hair care than ravishing rosemary. The Romans used this ancient herb and Egyptians to prevent baldness, darken graying hair, moisturize dry scalp, speed hair growth, strengthen the hair and prevents split ends. Today, rosemary is one of the most popular ingredients in commercial and natural hair care products. 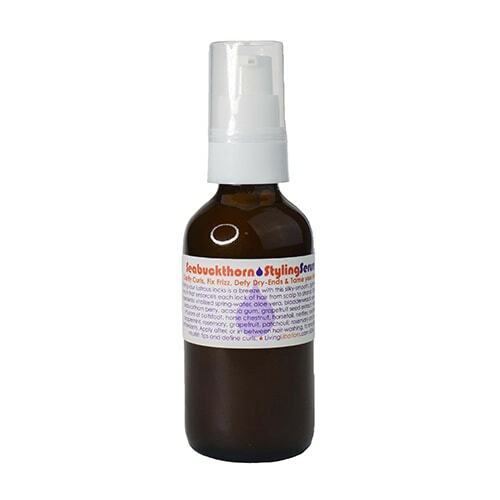 Patchouli (Pogostemon Cablin) – The astringent qualities of patchouli make it an excellent ingredient for the prevention of moisture loss. Patchouli protects scalp skin thanks to its anti-inflammatory, antifungal, and antiseptic properties. Grapefruit (Citrus Paradisi) – Grapefruit oil works seamlessly with grapefruit seed extract to increase vitality and shine. Grapefruit helps to cleanse impurities from the scalp while priming hair for optimal regrowth. Super-Critical Antioxidants of Rosemary (Rosmarinus Officinalis) and Sage (Salvia Officinalis): Like our Seabuckthorn, Living Libations’ extractions of Rosemary and Sage are a supercritical extraction. This type of extraction yields a very potent and pure nectar that contains hundreds of plant bio-actives and antioxidant activity. SUPER-CRITICAL ANTIOXIDANTS OF ROSEMARY (Rosmarinus Officinalis) and SAGE (Salvia Officinalis): Like our Seabuckthorn, Living Libations' extractions of Rosemary and Sage are a supercritical extraction. This type of extraction yields a very potent and pure nectar that contains hundreds of plant bio-actives and antioxidant activity.